2. Seeking the Wisdom of Others … Is That Wise? 13. How Can I Glorify God in This Mess? Dennis Johnson, The Message of Acts in the History of Redemption (Phillipsburg, NJ: P & R Publishing, 1997). David Powlison, Power Encounters: Reclaiming Spiritual Warfare (Grand Rapids, MI: Baker Books, 1995). Timothy S. Lane and Paul David Tripp, How People Change (Greensboro,NC: New Growth Press, 2008). David Powlison, Seeing With New Eyes: Counseling and the Human Condition Through the Lens of Scripture (Phillipsburg,NJ: P & R Publishing, 2003). Jim Van Yperen, Making Peace: A Guide to Overcoming Church Conflict (Chicago, IL: Moody Publishers, 2002). Jerry Bridges, Trusting God: Even When Life Hurts (Colorado Springs, CO: NavPress, 1988). J. Ligon Duncan III, Does Grace Grow Best in Winter? (Phillipsburg,NJ: P&R Publishing, 2009). R. C. Sproul, The Holiness of God (Wheaton, IL: Tyndale House Publishers, 1988). Carolyn Custis James, When Life and Beliefs Collide: How Knowing God Makes a Difference (Grand Rapids,MI: Zondervan, 2001). John Piper, Think: The Life of the Mind and the Love of God (Wheaton,IL: Crossway, 2010). Paul David Tripp, A Quest For More: Living for Something Bigger Than You (Greensboro, NC: New Growth Press, 2007). Mike Emlet, CrossTalk: Where Life and Scripture Meet (Greensboro,NC: New Growth Press, 2009). John Piper and Justin Taylor, The Power of Words and the Wonder of God (Wheaton,IL: Crossway, 2008). Paul David Tripp, War of Words: Getting to the Heart of Your Communication Struggles (Phillipsburg, NJ: P&R Publishing, 2000). Edmund P. Clowney, Called to the Ministry (Phillipsburg, NJ: P&R Publishing, 1976). Charles Dunahoo, Making Kingdom Disciples (Phillipsburg,NJ: P&R Publishing, 2006). Paul David Tripp, Instruments in the Redeemer’s Hands: People in Need of Change Helping People in Need of Change (Phillipsburg, NJ: P & R Publishing, 2002). Steven B. Cowan, Ed., Who Runs The Church? Four Views on Church Government (Grand Rapids,MI: Zondervan, 2004). Wayne A. Mack and David Swavely, Life in the Father’s House (Phillipsburg, NJ: P&R Publishing, 1996). Colin Marshall and Tony Payne, The Trellis and the Vine: The Ministry Mind-Shift That Changes Everything (Matthias Media: 2009). John Stott, Basic Christian Leadership: Biblical Models of Church, Gospel and Ministry (Downers Grove, IL: IntervarsityPress, 2006). Elyse Fitzpatrick, Idols of the Heart (Phillipsburg,NJ: P&R Publishing, 2001). Kris Lundgaard, The Enemy Within; Straight Talk About the Power and Defeat of Sin (Phillipsburg, NJ: P&R Publishing, 1998). Cornelius Plantinga, Jr., Not the Way It’s Supposed to Be: A Breviary of Sin (Eerdmans Publishing, 1995). Edmond P. Clowney, The Church (Downers Grove, IL: InterVarsity Press, 1995). Mark Dever and Paul Alexander, The Deliberate Church: Building Your Ministry on the Gospel (Wheaton, IL: Crossway, 2005). Donald S. Whitney, Spiritual Disciplines within the Church: Participating Fully in the Body of Christ (Chicago, IL: Moody, 1996). Ajith Fernando, Jesus-Driven Ministry (Wheaton,IL: Crossway Books, 2002). Timothy S. Laniak, While Shepherds Watch Their Flocks: Reflections on Biblical Leadership (Matthews, NC: ShepherdLeader Publications, 2007). Barbara Miller Juliani, ed., The Heart of a Servant Leader: Letters from Jack Miller (Phillipsburg, NJ: P&R Publishing, 2004). Timothy Z. Witmer, The Shepherd Leader: Achieving Effective Shepherding in Your Church (Phillipsburg, NJ: P & R Publishing, 2010). Thabiti Anyabwile, What is a Healthy Church Member? (Wheaton,IL: Crossway, 2008). Edmund P. Clowney, Living In Christ’s Church (Suwanee, GA: Great Commissions Publications, 1986). Elyse Fitzpatrick and Dennis Johnson, Counsel from the Cross—Connecting Broken People to the Love of Christ (Wheaton,IL: Crossway, 2009). Joshua Harris, Stop Dating the Church—Fall in Love with the Family of God (Colorado Springs, CO: Multnomah Books, 2004). Kevin DeYoung and Ted Kluck, Why We Love the Church–In Praise of Institutions and Organized Religion (Chicago,IL: Moody Publishers, 2009). Mark Dever, Nine Marks of a Healthy Church (Wheaton,IL: Crossway Books, 2000). Jonathan Leeman, The Church and the Surprising Offense of God’s Love: Reintroducing the Doctrines of Church Membership and Discipline (Wheaton,IL: Crossway Books, 2010). Tara Barthel and Judy Dabler, Peacemaking Women: Biblical Hope for Resolving Conflict (Grand Rapids, MI: Baker Books, 2005). Alfred Poirier, The Peacemaking Pastor (Grand Rapids, MI: Baker Books, 2006). Ken Sande, The Peacemaker: A Biblical Guide To Resolving Personal Conflict, third edition (Grand Rapids,MI: Baker Books, 2004). Ken Sande and Kevin Johnson, The Peacemaker Student Edition (Grand Rapids, MI: Baker Books, 2008). Jerry Bridges, Respectable Sins: Confronting the Sins We Tolerate (Colorado Springs,CO: NavPress, 2007). Bryan Chapell, Holiness by Grace: Delighting in the Joy That Is Our Strength (Wheaton, IL: Crossway, 2003). Ted Kober, Confession & Forgiveness: Professing Faith as Ambassadors of Reconciliation (St. Louis,MO: Concordia Publishing House, 2002). Alfred Poirier, The Peacemaking Pastor (Grand Rapids,MI: Baker Books, 2006). 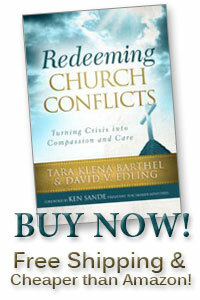 Ken Sande and Ted Kober, Guiding People through Conflict (Billings, MT: Peacemaker Ministries, 1998). Timothy S. Lane and Paul David Tripp, Relationships: A Mess Worth Making (Greensboro, NC: New Growth Press, 2008). Nancy Leigh de Moss, Choosing Forgiveness: Your Journey to Freedom (Chicago,IL: Moody Publishers, 2006). Patrick H. Morison, Forgive! As the Lord Forgave You (Phillipsburg, NJ: Presbyterian and Reformed Publishing, 1987).